Let your feet be the hottest things around town with GAVEN by Django & Juliette. 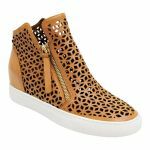 The same make as your Winter favourite Gisele, Gaven is decorated with tiny laser cut diamonds so that your feet are able breathe when the warmer weather comes around. 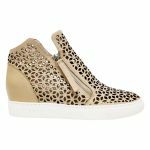 These comfortable wedge shoes provide 4cm of height and lots of comfort on foot. This is the kind of shoe that you would do the grocery shopping, lunch with the girls and the school time pickup in all without having to take a break for sore feet!